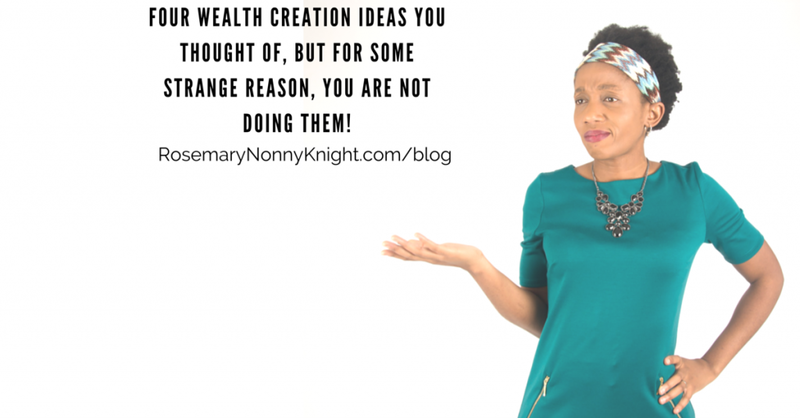 Four Wealth Creation Ideas You Thought Of – But For Some Strange Reason, You Are Not Doing Them! 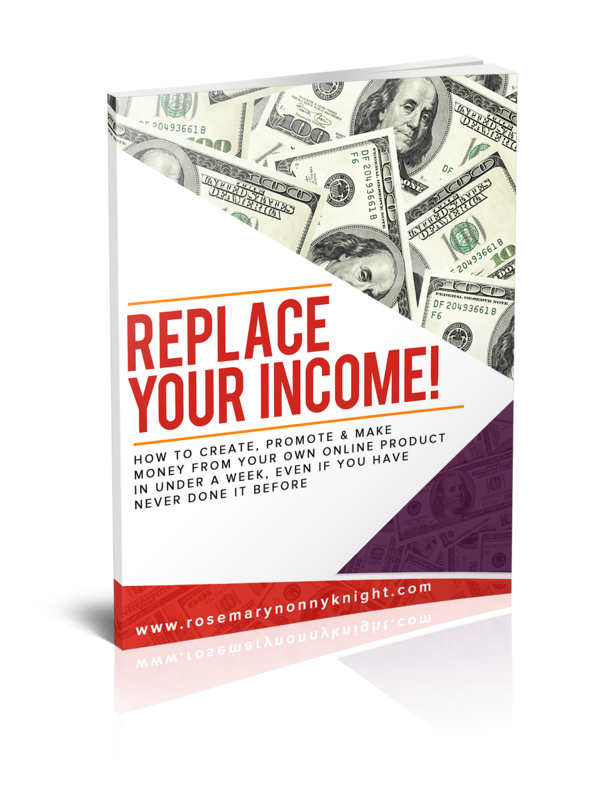 Every day, I have business owners ask me how they can increase the income from their business. They struggle to get more customers or find more deals (if in property). They dart from one money-making activity to another and they are yet to actually see any massive result from anything. They attend this webinar then the next one and they refuse to commit to sticking with one thing until they see success. Everything seems like a great idea so they try to fit it all in! And I can only talk about this because that was my life for a very long time and this year for me has been the year of simplification, even my hair has taken a hit! This has been the year of stripping back to bare bones and seeing what actually lies beneath it all. And as a result, here are my top ideas for creating wealth – You know it and yet, do you? Because to know and not to do, is not to know! You must get exceedingly clear on what it is you are trying to create. There is absolutely no point running around like a headless chicken, dabbling at this, trying that, stopping when it gets uncomfortable and then wondering why the money never ever seems to come your way in the way it comes to other people. So, your first goal is to get extremely clear on what you want out of this life and out of your business. And yes, I know it may change but for today, get clear on where you are at right now. A lot of people expect that everything they want is going to drop from the sky with absolutely no effort from them or so their actions seem to dictate. And again, they get to wondering why nothing ever seems to change for them. Honey, to attract the kind of wealth you want in your life and to do the things you really want to do, there will be effort – some might even call it suffering. Why? Because what you want is not the norm! What you want is only achieved by continual, deliberate effort. A commitment to do what most will not do in order to create what others will go to the grave still dreaming about. You need to get an abundance mindset. If any part of you thinks that your wealth creation means someone else’s poverty then you will continually get in your own way. You need to eliminate that immediately from your thinking. Choose instead to think that there is abundance everywhere and all you need to do is tap into it. Do not concern yourself with what other people think or what other people are doing – YOU must choose to look for abundance everywhere because once you start to look, it is pretty surprising what you will find. Which leads on to this point – GET RID of guilt! You may think it is noble to accommodate all the whims of people around you but that only gets in the way of you building a business, a life that is fulfilling and powerful. Guilt is a completely pointless emotion. It stops you from thinking clearly and it makes you do things that hold you back. Ask yourself this – If I did not feel guilty, what would I be doing? And add it to the list of things on your ‘what I want’ list. A lot of the things you spend time feeling guilty are completely silly when you actually stop to think about it. I used to feel guilty about how much time I spend or did not spend with my kids – Bearing in mind that I home educate so I possibly spend more time with them than most – I kinda got it into my head that my working was bad for them and they picked it up and started playing me on my guilt. Thankfully, due to some amazing coaches that I work with, I was able to see what the root of this was and the moment I saw it, I felt set free! And I have not heard a peep about it from my kids again. I wonder what behaviours I was indulging that meant they picked up and used my guilt to beat me over the head. Not their fault of course, it was what I taught them to do! What guilt is playing on your mind? And who are you allowing to use it to control you? In the quest for wealth creation and money, paying attention to the seemingly little things that hold you back is very, very important. Everything good starts with awareness. You cannot fix what you refuse to face. And if you are ready to create wealth in abundance then you must join me on Tuesday 815pm UK Time for a free masterclass. 20 Ways To Create Wealth – Discover How You Can Get Rid Of Anxiety, Distress, Frustration, Neediness & Uncertainty By Finally Getting Yourself Aligned With The Beliefs Essential For Wealth Creation. Come with paper and a pen to take copious notes to go and implement in your life.